Star Wars Celebration is going on right now in Chicago and the first major panel was kicked off by none other than “I saw the first Star Wars three weeks before any of you” super fan Stephen Colbert. He was joined by Director J.J. Abrams, President of Lucasfilm Kathleen Kennedy, as well as the entire cast of the new movie. There’s a lot to glean from this short teaser. At some point, Rey is back on a desert planet. We’re not sure if it’s Jakku or Tattooine, or somewhere else entirely (how many desert planets are there in the Star Wars galaxy? 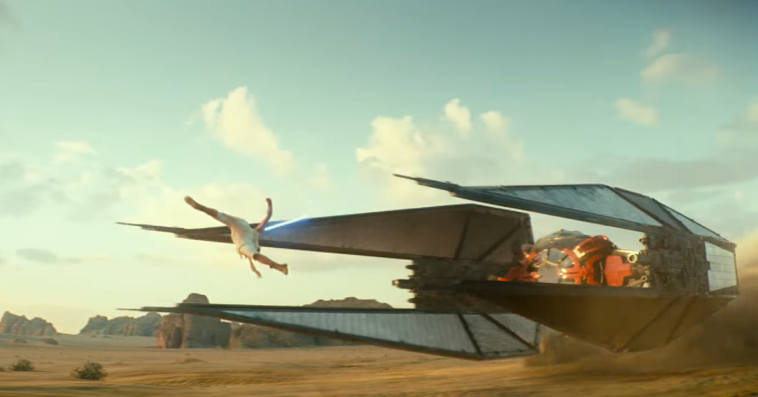 Rey is very strong with the Force as she leaps over what appears to be Kylo Ren’s personal star fighter. It looks like we’re going to see at least one battle. Wouldn’t be “Star Wars” without one. Also, RIP to this Resistance soldier. As mentioned earlier, BB-8 has a new friend in the form of Dio. He looks like a duck on a big ol’ wheel. Love. The scoundrel from Cloud City is back in the cockpit of the Millennium Falcon. It might be too much to ask for a flashback so we can see Donald Glover again, but fingers crossed. As promised, Carrie Fisher will reprise her role as General Leia Organa, despite passing away before production on the film began. Abrams and co. assured fans that there would be no hologram nonsense and that they got enough footage from the prior two movies to make it work. Everyone’s favorite hated Emperor does his signature cackle at the end of the teaser. Actor Ian McDiarmid himself walked on stage after the reveal, urging JJ to “roll it again.” Was he Snoke’s master? Is he still falling down that big hole? We’ll have to wait and see. Speaking of waiting and seeing, The Rise of Skywalker (still processing that title) will be out this December.